Plenty of Fish or POF is an online dating site that is very much popular in countries like the United Kingdom, Canada, Australia, Ireland, Brazil, and the US. With around 100 million users, it is one of the most used dating sites. Also, it is available in nine different languages. It is free to use but offers premium membership as well. Many people join the site for casual friendship or in search of a relationship. Many may have found the perfect match, and many want to get rid of their POF account. Before you deactivate POF account, you must be sure whether you want to delete your plenty of fish account permanently or want to temporary hide POF profile. While doing the former means, you will not get access to your account thereafter; the latter means that you can log in again whenever you want to. If you are annoyed or have already found someone perfect in your life, then you can delete your account permanently. 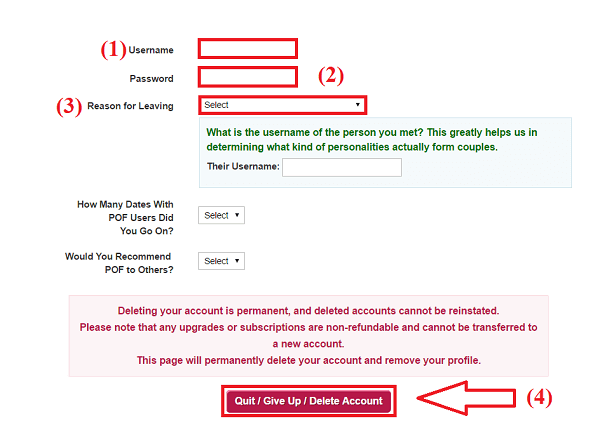 Here we will show you the steps and procedures that will help you delete/cancel your POF account. Step 1: Open any web browser of your choice and browse the home page of Plenty of Fish. Step 2: Enter the necessary details like the username or email that is associated with your account. Then you must click on Check mail. Step 3: Then click on Help tab present on the top right corner of the page just before the Logout option. Step 4: There are many options available there, you must click on Delete Account present under “how do I delete my POF account” column. Step 5: This will lead you to the POF’s account deletion page. If you visit the page without logging in, then you will have to fill in the details like username and password to reach the delete page. Step 6: After reaching the deletion page you have to fill in details like your username, password, why are you deleting your account, how many dates you went using the site or whether you will recommend Plenty of fish to others or not. Also, it will show a warning message that if you delete your account, you will not be able to use any of your data that is synced with the site again. Step 7: After entering all the essential information you must click on “Quite/ Give Up / Delete Account” button. It’s seen that many times even after all the steps; your account does not get deleted. In this case, you can send a mail to the customer care service and request them to permanently delete your POF account with a reason as to why you want to delete it. As mentioned earlier, once you delete your account, you cannot recover it again, and all your details and data will also get lost. So you must be entirely sure that you want to delete your account. 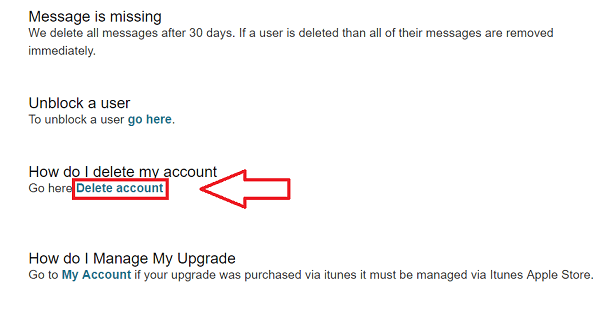 However, if you only want a temporary break from POF, you can go for deactivating your account. Step 2: Enter the login details and fill the username and password of your account that you need to hide temporarily. Step 4: Then select the option “To hide your profile from others, click here” option. After this, your account will get hidden. No one will be able to see your picture if they search. And no one will be able to contact. Thus, the steps mentioned above to delete/cancel or deactivate POF profile are easy to follow and implement.